Planners tend to promote formal plans as the only game in town while diverse efforts of urban actors shape our cities. Tracking the development of American "neighborhood unit" concept in independent India’s planning practice and literature—from the national level policies to on-the-ground applications in the city of Jaipur—Vidyarthi explains how a host of actors including neighborhood residents, squatters, politicians and developers made different kinds of plans that assimilated the design concept in line with their practical concerns and cultural preferences creating unique variants of neighborhood urbanism over time. One Idea, Many Plans counters misguided characterization of these unforeseen efforts as ‘unauthorized’ by state authorities. 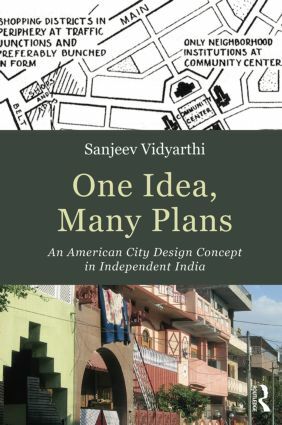 It shows how the frequently informal and tacit plans were neither arbitrary actions nor aimless subversions but purposeful future-oriented efforts that shaped the envisaged sociality and spatiality of Indian cities in more meaningful ways than the official master plans promoting planned neighborhoods. Carefully illustrating the different kinds of plans local actors use to guide incremental adaptation, improvement and investment, Vidyarthi offers insights about how we might improve formal plan making. Scholars, students and professional practitioners interested in different regions of the global south would find these lessons useful as a new generation of city design ideas like sustainability and new urbanism gain traction in an increasingly globalized World.